Superlex Premium Power Marine Batteries are designed internally through the revolutionary Dynamic Energy Technology® process that has been proven to provide a premium product. Should the application apply to the serious fisherman or the water enthusiast that loves an enjoyable day on the water, the Superlex Marine line provides dependable starting and deep cycling power. The DET process allows maximum performance from the internal plate which provides higher cranking power and more amperage for reserve capacity, while providing optimum battery life. The Superlex manufacturing plant consists of new modern micro-process controlled equipment with more than 135 quality check points that ensure dependable quality, time after time. Superlex Premium Power batteries are backed by a nationwide warranty (USA), and a dealer/distributor network that is highly supportive and effective. This quality process guarantees a battery truly superior to its peers while providing reliable service to the consumer and excellent dealer/market share opportunities. 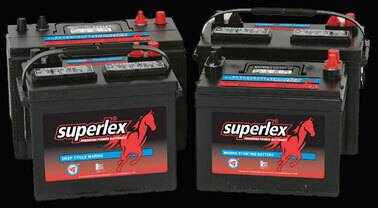 Superlex Marine batteries are indisputably a premium product.